We must have more cowboy hats! I asked the staff a question the other day regarding the missing purple cowboy hat. I demand hat equality for all! We must have the purple cowboy hat returned! So, right now we have the Dark Brown, Brown, Green, Black, Jean Blue, and Grey hats. 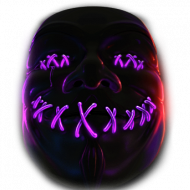 I would like the purple cowboy hat to make it's return! Here's my suggestion. As I spoke to @Aeryes about this, he stated not many players were liking the neon colors, which frankly I agree to some extent. I was hoping perhaps you could however bring more leather eye-appealing colors to the cowboy hats. As you may have noticed a lot of players are liking the "Jean Blue" cowboy hat, perhaps you can make a more-Violet hue colored variation of the Jean Blue cowboy hat, that way it isn't a solid neon purple, and looks a bit odd considering the hat is made of leather. I would definitely go more so for the "washed out" colors for leather items. My other suggestion, was to ask for a cowboy hat that matches the current in-game chest-holster. 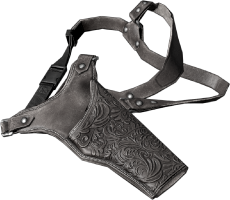 ...And possibly add a "dark-leather" version of this holster ... So it can match neutral colored outfits. Players tend to wear green, black, or darker colors in general. Leather is cool and all, but the implication of adding in the previous stuff again.. ugh.. Neon coloured clothes make my eyes water. I agree, I don't really like the Neon colored clothing either. Which is why I stated the rest of what I wrote in my original post. I think washed-out colors, that are realistic to a natural leather or dyed appearance would be eye-appealing and nice to have on the server. If people want fully colors like the reworking of the neon mountain bags I'm all for it. I don't see why not. If people don't want to wear it...leave it on the ground. The more combos of colours and variety of clothing the better in my opinion. As long as it doesn't hurt the server. @Aeryes That poll good enough for ya? If you decide to work on this, I'd prioritize the re-texture of the chest-holster first. I really want to see a neutral colored chest-holster. Then go for neon & "washed-out" cowboy hat colors. 70% required for me to enact the idea. Mmmm let's see what the big man says to these colors @Roland if he gives me the thumbs up I'll do it. As far as Im concerned the items should not be "MY EYES!!!" bright, but the colors should still exist. 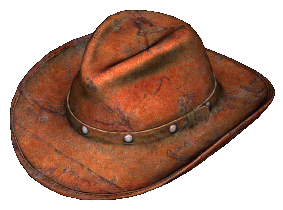 I dont see any harm in having purple cowboy hats and stuff in game, as long as the textures arent super bright.